Aloft Hotels, part of Starwood Hotels & Resorts Worldwide, Inc. (NYSE: HOT), announced the opening of Aloft Seoul Gangnam, bringing its passion for live music, vibrant design-led initiatives, and innovative new technology to the chic and bustling district of Gangnam in southern Seoul, South Korea, October 1st, 2014. Owned by renowned energy distribution & real estate development company, Daeshin Investment & Development Co., Ltd., the hotel offers a vibrant destination in the hip and buzzing area. Aloft Seoul Gangnam features 188 urban-inspired guest rooms, including four suites, with many of the brand’s signature features including ultra-comfortable signature platform beds with plush bedding, walk-in showers with custom amenities by Bliss® Spa, complimentary bottled water, and signature coffee. In addition, each room combines innovative business and entertainment equipment such as plug-n-play docking stations that link tablets, laptops, or music devices to the room’s 42” LCD TV and also complimentary internet access. Aloft Seoul Gangnam will offer 64 square meters of tech-inspired meeting space, including three versatile meeting rooms that can comfortably seat up to 48 people in a theater-style setting. Aloft Seoul Gangnam also offers aa number of spaces for guests to mix and mingle, work, or simply relax - including the brand’s signature 24-hour grab-and-go beverage area, Re:fuel by Aloft℠; Nook, the hotel’s signature all-day dining restaurant serving buffet breakfast and diverse international selections from an á la carte menu; and the well-equipped Re:chargeSM fitness centre. Guests can also catch emerging music acts at the W XYZ ®bar, where music, cocktails, and fun flow freely. Located on Yeongdong-daero, one of Gangnam’s major thoroughfares, Aloft Seoul Gangnam is 11 kilometers from Seoul’s city center, and 50 kilometers from Incheon International Airport. The hotel allows for easy access to the COEX Convention and Exhibition Center, as well as the office district in Samsung-dong. It is also a great base for exploring Seoul’s rich culture and history, including UNESCO Heritage treasures; engaging in luxury retail therapy at a shopping area styled as the Beverly Hills of Seoul; and pursuing endless pulsating nightlife. 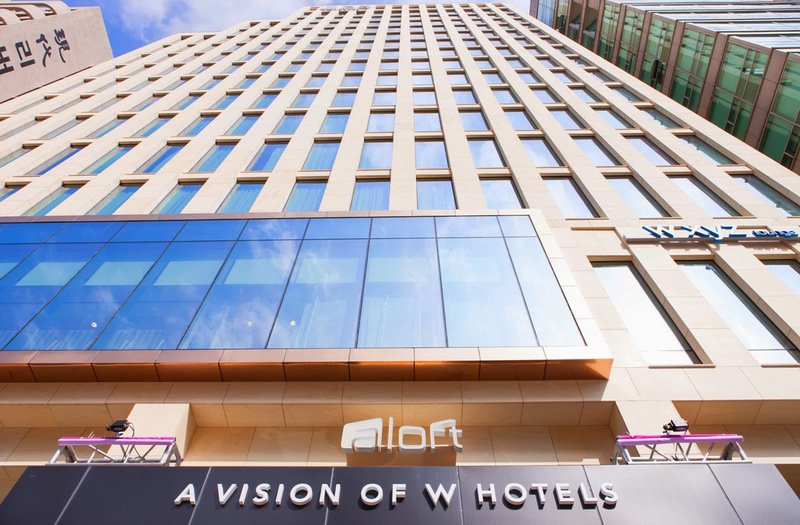 Aloft Seoul Gangnam is testament to the Aloft brand’s growing momentum in Asia Pacific, as well as Starwood’s robust expansion in the region. There are currently 15 operating Aloft hotels in Asia Pacific, with another 17 in the pipeline. Starwood has maintained its presence in South Korea for over 20 years and with the Aloft brand, currently houses four of the nine Starwood brands, including Westin, Sheraton, and W Hotel brands. To celebrate its official opening, Aloft Seoul Gangnam is offering a special package for a one night’s stay in the Chic Room, at the rate of KRW170,000+ till end November 2014; and KRW150,000+ from December 2014 to March 2015. Rates include breakfast for one at Nook restaurant, complimentary access to Re:chargeSM fitness center, and special SPG Double Points for Starwood Preferred Guest® members. To make reservations, please contact +82 2 510 9700 or rsvn@aloftseoulgangnam.com.